A play by Dawar Mehmood.Produced by Hareem, Imran Gulzar and Dawar. 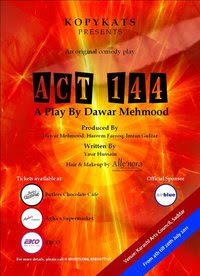 This theatrical production is being re-enacted at the arts council from the 4th to the 20th of July 2011. It has had one of the best reviews in the capital state and is now coming to the metropolitan. a definate must see!